Natural Gas Technical Outlook - Reversal Ahead ? You are here: Home / Commodities / Natural Gas Technical Outlook – Reversal Ahead ? 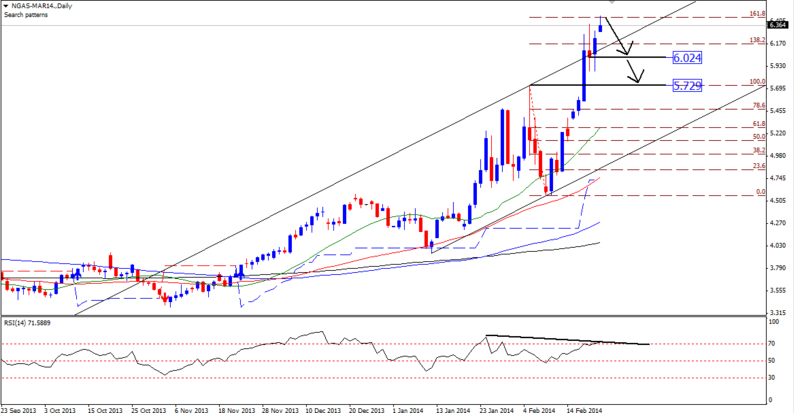 Natural Gas Technical Outlook – Reversal Ahead ? Natural gas (24.02.14) respected our last 3 articles & almost doubled in price. Hope you all enjoyed. Now natural gas is trading around $6.37 & as we can see on charts , this area is just below the 61.8% feb correction level of the last downside wave. As the last downside move was very ideal technical move & in respect to that current bounce should be very ideal. At the same time we witness a very strong negative divergence on RSI , pointing for a quick downside move. 3 major gap on charts , too indicate for a reversal or profit booking. Visit here for MCX Natural Gas 5min charts with Algorithmic Trading Signals. On fundamental side, inventory still on lowest level since 2004 but upcoming reactivation of production rings & mix weather forecast may reduce the of natural gas as heating option. Based on above studies, we will prefer to take a short position on natural gas for possible targets around $6.25 & then $5.730. A day close above $6.45 will delay the projection. Natural Gas – One More Pump Pending? Now natural gas march future is trading around $4.810 & as we can see on charts the over bought indicators added more space after yesterday profit booking session. Done with both the targets in Natural Gas! lost close to 20% from the peak in MCX Natural Gas!